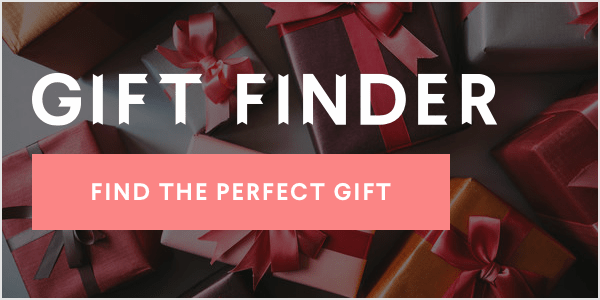 Can't decide between pumpkin and pecan pie at the holiday table? 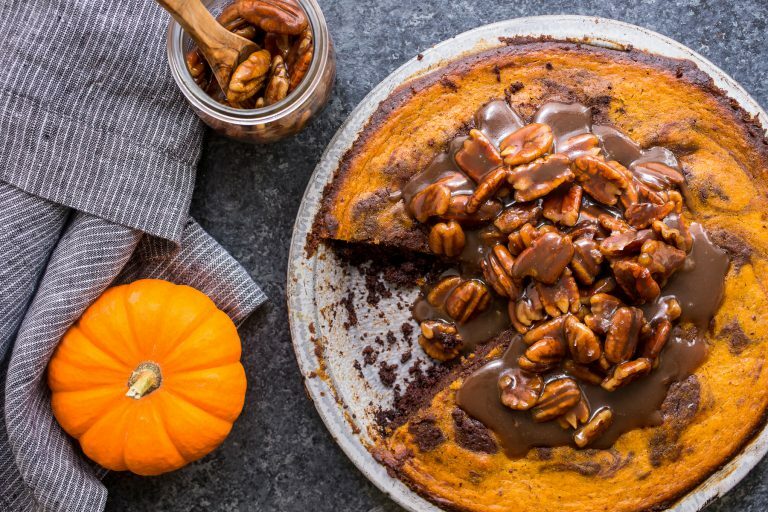 Bourbon Brownie Pumpkin Pie with Pecan Topping is just the dessert you are looking for! Take a big slice of this boozy, chocolaty and pumpkin-y pie! Only one week until Thanksgiving! Have you started to cook yet? Are you even hosting? While I don't host, my apartment could never fit the size of my family and well neither could my kitchen, I do always help prep and cook the meal with my brother any year he happens to be hosting. As a former executive chef (him) and me a current foodservice operation owner, we run a pretty tight and organized ship. Last year our prep was completed in just a few hours the day before that when Thanksgiving rolled around we were in such a relaxed state it felt weird, as if something was missing. It wasn't and dinner was delicious. Not surprisingly of course dessert is always left in my hands. One or two items may be purchased or a family member might take on a pie of their own but the bulk of it goes to me, the resident baker in the house. I think unlike the main meal, dessert is one area you can go and have some fun with, stray far away from tradition and not have the family revolt on you. So while this Bourbon Brown Pumpkin Pie isn't totally wild and crazy, it's certainly a little left of field than you would normally find on your holiday table. It's pumpkin pie, kicked up about 3 notches and worth every single extra holiday calorie. After all who wants to make a choice between pumpkin pie and pecan pie? Instead I made that decision for you by combining the two together. You see I like pie, I like eating pie but I hate making pie. It's the crust that gets me every time, it's so fussy and I rarely manage to make a pretty one. A brownie crust on the other hand? Doesn't need to be pretty and doesn't need to be fussy. Plus, it's chocolate and pumpkin and pecans and bourbon, it's exactly the high note you want to end your holiday meal on. -Heat your oven to 350°F and line a rimmed baking sheet with foil (for spill overs). -Melt the chocolate and butter either in a double boiler or in 30-second increments in your microwave, then stir in the sugar, vanilla, eggs, flour, cocoa powder, and salt. -Grease a 9-inch deep dish pie pan or two standard size pie pans and pour 3/4 of the brownie in the pie pan (if using two, divide accordingly). Bake the brownie for 20 minutes in the pre-heated oven placed on top of the baking sheet. -While the brownie is baking prepare the pumpkin pie filling. In a medium bowl whisk together the pumpkin, heavy cream, egg, brown sugar, pumpkin spice and salt. Remove the brownie from the oven and carefully pour in the filling making sure not to overfill the pie. Take the remaining brownie and drop spoonfulls on the top of the pie, then swirl with a butter knife. Place the pie on the baking sheet back in the oven to bake for 35-40 minutes or until completely set in the center. -Let the pie cool completely before preparing the topping. At this point the pie can be made ahead of time and kept at room temperature for 1 day or in the refrigerator for a longer duration. -When ready to serve make the pecan topping by adding the brown sugar, maple syrup, butter, and pecans to a sauté pan over medium heat. Stir until the sugar has dissolved completely and the mixture has come to a boil. Stir in the heavy cream, bourbon, vanilla extract, and salt and bring back up to a boil. Cook for about 2-3 minutes until the sauce is nice and thick. Turn off the heat and let cool for about 10 minutes before spooning on top of the pie or serving on the side. 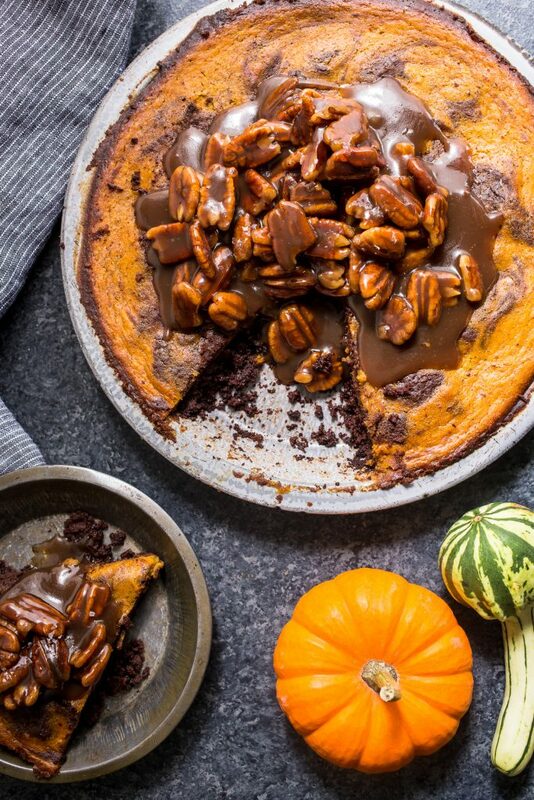 The post Bourbon Brownie Pumpkin Pie appeared first on Girl in the Little Red Kitchen.